Baghdad (ANN)-Iraq’s electoral commission has announced the Sa’iroun (Marchers) political bloc, cleric Moqtada al-Sadr’s alliance with communists, as the winner of the country’s parliamentary elections. 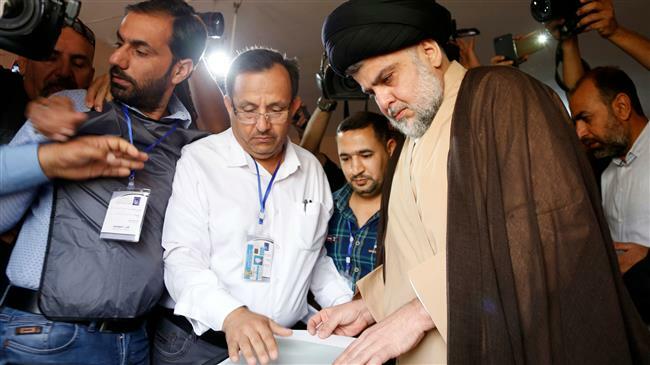 Sadr’s alliance, which contested in Iraq’s elections for the first time, captured 54 parliamentary seats, the commission said on Saturday. Sadr’s movement forms the backbone of the Sa’iroun alliance, but the senior Shia cleric himself, who enjoys a strong support, did not contest the elections. Iraqis voted last Saturday in the first national elections since the country declared complete victory over Daesh. Over 7,000 candidates contested the 329 seats in the parliament that will choose a new president, prime minister and government in Iraq. This is the fourth such polls since the 2003 US invasion that led to a sharp rise in sectarian tensions and ensuing terror-related violence in the Arab country. The next prime minster will face the huge task of rebuilding a country shattered by the war against Daesh and the US invasion. Last December, Abadi declared the end of the anti-Daesh campaign in the Arab country. The group’s remnants, though, keep staging sporadic attacks across Iraq.